Located on the promenade Les Ramblas, 100m from Drassanes underground station and a 15-minute walk from the beach, Arc La Rambla invites tourists to enjoy rich cultural and historical heritage of the city. The air-conditioned rooms come complete with en suite bathroom facilities and satellite TV. Situated in the heart of Barcelona in the Raval District, just 500m from Las Ramblas and Liceu underground station, Abba Rambla Hotel offers an ideal base for exploring the city’s main attractions. The rooms are fitted with air conditioning, satellite TV, safes and minibars. Some rooms feature balconies. 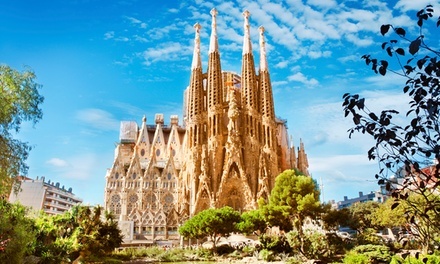 Cultural wonder seekers will rejoice in admiring UNESCO World Heritage Sites, such as the architectural works of Antoni Gaudí and Lluís Domènech i Montaner, including world-renowned La Sagrada Familia. Live music fans can take a walk down venues such as Razzmatazz and Apolo, while classical music lovers can take advantage of the many concert halls this city has to offer, from The Gran Teatre del Liceu to the modernista Palau de la Música Catalana. Ramblers can climb the Montjuïic and revel in a panoramic view of the city, followed by more chill-out time spent sipping a cocktail at the outdoor bars and cafes along La Rambla. To make the most of the Spanish experience, tourists can head to flamenco talent display sites and witness genuine spectacles from internationally acclaimed dancers. During summer, temperatures can rise up to 28°C, but low humidity and a steady breeze help keep the weather conditions comfortable. September is the wettest month of the year, while in October temperatures drop to 21°C. November is much cooler, but mild temperatures still range between 8°C and 17°C. Winter comes in December and brings rather cold weather conditions that may be accompanied by snow and rainfall. Although temperatures may fluctuate in different seasons, Barcelona remains suitable for visitors discovering this cosmopolitan city. Cancellation Policy: No modification or cancellation allowed after booking confirmation. Bookings are non-refundable and non-transferable to another destination once confirmed. Validity: Valid for arrivals on dates from May to Dec 2018. Price per person (pp) based on double occupancy. You must buy 2 vouchers min. to complete booking. If you want to travel alone, single supplements will apply based on the departure date and time. Please enquire with the Travel Provider at the time of booking. Validity period depends on option purchased (date and number of nights). Booking: Must book within 7 days after voucher purchase and at least 20 days ahead of departure. Booking required by phone: 012469696 or via online form: http://fsform.co.uk/gie/ie/bi/barcelona_getaway. Attach your coupon there. You will receive confirmation of your reservation by the merchant by email after filling out the online form. Book your place immediately after buying the voucher to confirm holiday and avoid disappointment. Purchasing the voucher does not guarantee the holiday, customers must book before travel and not possible to just turn up. Confirmations will be sent out within 3 working days from the date the booking is completed with the Travel Provider. Limit of 4 vouchers per person. May buy extra as gifts but cannot buy more to extend deal. Transportation details: The hotels are located in Barcelona, Spain. Valid for direct flights from Dublin airport to Barcelona (BCN) airport. Travel documents to be received up to 1 day before departure. You must go with your boarding pass printed at the airport, at the risk of having to pay additional charges. Depending on flight schedules and transfers, the first or the last night might not be entirely spent in the hotel. Flight departure points, dates and hours are subject to availability. This is a special offer and is based on specific flight times, dates, airlines and airports and will be advised at the time of booking with the Travel Provider. If the featured hotel is unavailiable, a hotel of similar or higher standard will be offered to customers at time of booking. Flights times range from outbound 6:15am-7pm, inbound 10:20am-11pm, alternatives may attract a supplement which will be confirmed at time of booking. Hand luggage: up to 10kg per person included. For hand luggage policy check here. Hold luggage: not included but can be booked with the Travel Provider at the time of booking. Cost for extra luggage: always depends on the airline and will be advised at the time of the booking by the Travel Provider. Not included: in-flight meals. Included: airport taxes. Other Information: City tax: € 0.72 city tax per person per night to be paid at both hotels. A valid passport is mandatory. Valid for stay in standard double or twin room. *Price from €119, per person, based on standard double or twin room occupancy. Vouchers sold by Groupon International Travel GmbH.